France's national rugby team will wear rainbow laces this weekend in support of Gareth Thomas following his assault. 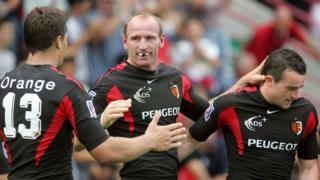 French Rugby Federation vice-president Serge Simon tweeted: "Dear Gareth Thomas, all French Rugby is with you." He added: "To show our support, the French rugby players will wear a rainbow shoe lace during the France - Fiji game on Saturday night. We're all in with you in this matter." Thomas, 44, who came out as gay in 2009, appeared bruised in a Twitter video, saying he was targeted because of his sexuality. Officers dealt with a 16-year-old boy by way of restorative justice following a request by Thomas, who is from Bridgend, to "send a positive message". Rugby referee Nigel Owens has commended Thomas on "his braveness". Owens, who is also gay, said he made a similar choice in 2015 after being sent abuse on Twitter. Thomas enjoyed a successful spell in French rugby between 2004 and 2007, helping Toulouse become European champions in 2005.